Suicide rates are headed in the wrong direction. In 2016, 45,000 Americans age 10 or older took their own lives, reflecting a rise of nearly 30 percent since 1999. We discuss the issue with Dr. Ahmad Hameed, a psychiatrist at Penn State Health Milton S. Hershey Medical Center. Description – The video begins inside Penn State College of Medicine. Two people are standing next to each other looking at the camera. From left to right is, Scott Gilbert and Dr. Ahmad Hameed. Scott Gilbert – From Penn State Health, this is Ask Us Anything About Suicide. I’m Scott Gilbert. Suicide rates are headed in the wrong direction. In 2016, 45,000 Americans aged 10 or older took their own lives. Reflecting a rise of nearly 30% since 1999. Statistically, about 120 people per day in the US commit suicide. We’re going to explore the issue and perhaps more importantly, how you can get help for someone you love on today’s program Ask Us Anything About Suicide. And here to talk with us is Dr. Ahmad Hamid. He’s a psychiatrist here at the Milton S. Hershey medical center. Thanks so much for your time today. Dr. Ahmad Hameed – Thank you Scott for giving me the opportunity to talk about this important public health issue. Scott Gilbert – My pleasure. And you know, we hear a lot about the numbers. Especially recently, suicide has been in the news. But to dive behind the numbers, for someone who’s a family member for who they’ve seen this happen to somebody. Somebody take their own life. All that matters is that one person. What is the impact like on family members, friends when this happens? Dr. Ahmad Hameed – Huge, the impact is huge. And the [inaudible] that family members struggle just why him? Why didn’t we see it coming? What we could have done to help and prevent this act? So there’s a lot of guilt, there are a lot of questions that they struggle with. Scott Gilbert – And of course as we mentioned in the introduction, the numbers are headed in the wrong way. We’ve seen a remarkable increase over the last 20 years or so. Do we have any idea what the main causes are? Knowing that there is not just one. Dr. Ahmad Hameed – There are multiple causes and you’re absolutely right. Over the last 20 years since 1999, the numbers have been steadily going up. And I think for 2016, we had about 45,000, around 45,000 suicides in the United States. It’s about 123, 125 suicides per day. Unfortunately, I would love for us to talk more about suicide throughout the year. Because again, as I mentioned, it’s a public health issue. But whenever there are celebrity suicides, people focus on why, when, what, and then with the passage of time, they forget about the other 125 plus suicides per day. So I think it’s really important for us to consistently talk about it. As far as what has been happening over the last 20 years or so, there are many factors. Economic downturn at one point is when in the early 2000’s it started creeping up. Access to firearms, opioids, difficulty getting into mental health providers, alcohol and drug use. These are all factors. Plus people are living longer. And as the data would show, extremes, the highest number of suicides are in folks between ages of 14 and 55. And then again, ages 85 and older. So these are the folks who are, these are the age groups which who are at the maximum risk of attempting suicide. Scott Gilbert – But we can’t say, paint over all of them with a broad brush and say it’s always depression that causes it, there’s no one mental health cause, right? Dr. Ahmad Hameed – No, no, there’s no one mental health cause. To put it simply, there are things that are risk factors. So but again, not all people who have those risk factors attempt suicide. So it’s predictably unpredictable. And that is the biggest problem with identifying people who actually are going to commit suicide. Scott Gilbert – You’re watching Ask Us Anything About Suicide from Penn State Health alongside Dr. Ahmad Hamid. I’m Scott Gilbert. And we welcome your questions. Whether you’re watching this video live or even on playback, feel free to add them to the comment section below this Facebook post and we’ll make sure that we get you some answers about this very important topic. You know, we talk about how, what should I look for in that family member? And it can be I think rather elusive. Sometimes you have people who will say “Oof, I’m going to kill myself.” And you think they might be joking. They might not. But sometimes the signs may be more subtle. So where to begin with spotting the signs? Dr. Ahmad Hameed “ Absolutely, Scott. Data has shown that about 90 to 95% of people who actually commit suicide have either a diagnosed or diagnosable mental health issue. It could be depression, it could be anxiety, it could be bipolar disorder, they could be suffering from [inaudible] related problems, could be schizophrenia or anything on those lines. So family members need to be very mindful of these people. Let’s say if you’re talking about somebody who’s sad and depressed, posting of the mood symptoms, sleeping too much, sleeping too little, isolating, getting their finances in line. Maybe going out and buying a firearm. Consuming too much alcohol, maybe pain medication. Scott Gilbert – All these things may be uncharacteristic of that person. Dr. Ahmad Hameed – Yes, absolutely. So they need to be mindful. On the other hand, if they have bipolar disorder, keeping an eye on their manic or hypomanic symptoms worsening. If they have issues with drugs and alcohol, keeping and identifying whether they are using more, and again, it’s– it happens, there is a pattern, so as far as family members are concerned, they should. And asking them, the most important thing is asking them are they okay? Do they need help? Do they need support? Do they want them to do something for them? These are important things. Family members should not be afraid to ask the question are you okay? Do you have any thoughts of hurting or harming yourself? These are very simple things. And remember, these folks who commit suicide or attempt suicide, a lot of time they’re just wanting somebody to just reach out and grab them and just latch onto them and prevent them from this act. Scott Gilbert – I know that we have a question from Lisa online, read along these lines, she’s asking how do we know if a loved one is serious, and what if they refuse to see a doctor? So let’s say that someone has kind of confronted the family member of tried to comfort them and say listen, I’m concerned for your wellbeing, I think you should get help. And if that person says no, what to do next? Dr. Ahmad Hameed – You’re absolutely– what I would tell the family member, they should not become somebody who’s an expert at identifying how high or low the risk factor is. The standard operating procedure and the prudent response is making sure that their loved one is connected with the right person who can help them and evaluate the risk. If they refuse, there are many options. They can be brought into an emergency room, crisis can be called in, police can be called in, where you can express your concerns with regards to loved one and then follow the standard operating procedure. But it’s extremely prudent for the loved one to be evaluated by the right person who can make the judgment as far as how high or low the risk is. Scott Gilbert – And we will make sure that we add in the comments section below this Facebook post links and phone numbers to resources that you can use if you suspect that something is not right with a friend or family member on this issue. 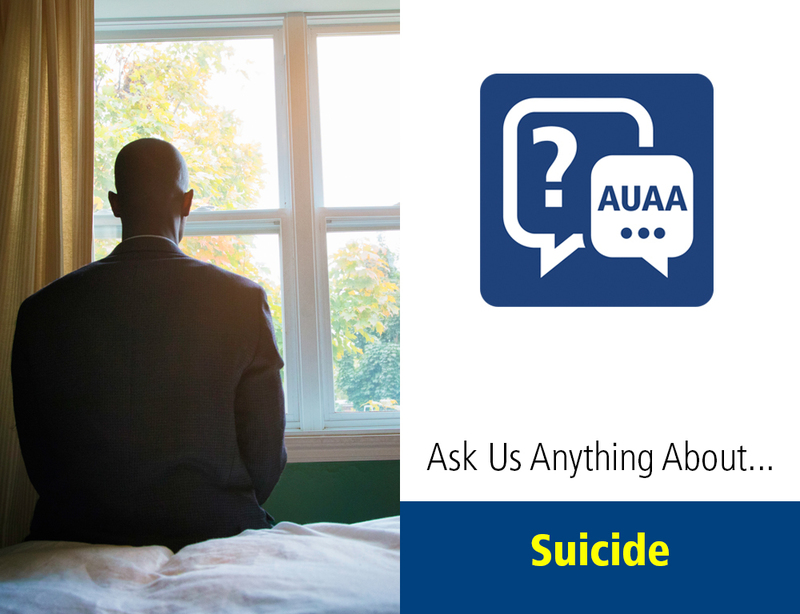 You’re watching Ask Us Anything About Suicide from Penn State Health. I’m Scott Gilbert alongside Dr. Ahmad Hamid. Here’s a psychiatrist here at the Milton S. Hershey medical center. And he welcomes your questions or your comments on this very important topic. Just leave them in the comment field below this post. And of course, if you find this interview helpful as we hope you do, we hope you’ll share it on your Facebook page to help us get the word out about this very important, this very important concern. You know statistically Dr. Hamid, more men than women commit suicide. Yet the CDC says that the rates among women are rising faster than men. What do we know about the gender disparities around this issue? Dr. Ahmad Hameed – Absolutely. Data over the last 20 years is absolutely clear. Men are four times, three to four times, more likely to commit suicide. And as far as women are concerned, they attempt more. And they have more suicide attempts. As we move forward, the– things that the men and women use as far as [inaudible] to complete the act are different. Majority of the time in men, they use firearms. Firearms are extremely lethal. When it comes to the opposite gender, the females, they generally at times, majority of the time, they use medications and overdose means which– where mortality is high, but again, immediate mortality, there are chances of recovering if found, correct? So I think those are the differences as we move forward. But again, the risk of suicide still is high in both genders but men four times more than women. Scott Gilbert – And when it comes to suicide risk and thinking about those issues, there’s certainly a stigma around this as there is with many mental health issues unfortunately. And I think that gets to Lisa’s other question. And that is what if it’s not a person to be openly, or you know, who will openly talk about their feelings? Someone who has, I think her point is, someone who especially doesn’t want to open up. Tends to bottle things up inside. Dr. Ahmad Hameed – Absolutely. And again, as I’ve said, it’s predictably unpredictable. For example, you have a loved one who’s not sharing anything with you and does not want to share anything with you. But you know that they are suffering. Rather than putting them in [inaudible] again, providing them the right resources or at least taking them to the person that they can talk to, is a starting point. Letting them know that you are there for them, letting them know that you will do anything for them, are I think a starting point. Trust is very important. Person needs to trust that the other person who they’re talking to is going to make the right decision for [inaudible]. Scott Gilbert – And establishing that baseline of trust first. Dr. Ahmad Hameed – Absolutely. That’s important. Because there are other times when people say, when people say that they don’t want their suffering, but they don’t want help because they feel that the other person might not, or whoever is evaluating them, might not understand and would send them some place or involuntarily commit them. And really people don’t want that, sort of prevent that, they would hide things. But again, the interest is important. Trust is a starting point. Scott Gilbert – When it comes to whether it’s therapy, medication, what are some of the most common interventions? I imagine it varies from case to case depending on what you’re dealing with. But what are some of those interventions that as a clinician you put to use? Dr. Ahmad Hameed – Absolutely. Starting point is treating the underlying mental health issue. The sadness, depression psychosis, bipolarity, stabilizing the patient. It’s very, very important. If there are drugs and alcohol involved, making sure that they are clean and they are clean for a longer period of time. Stabilizing the [inaudible] symptoms is much more important. At times, it’s impulsive. For example, after a breakup of a relationship, legal trouble, financial troubles, it happens. So putting some gap between them and their action is important. So at least at that point in time, the person who has these impulses, which are specific to a certain event, not mental health issues, but specific to a certain event, they have time to recalibrate, reprocess, rethink the consequences of their actions. And a lot of time, with the passage of time, they realize that even though suicide or suicide attempt might look good initially, but that’s not the right thing for them to do, it’s not the right thing for them to do to the family and loved ones. Scott Gilbert – Dr. Ahmad Hamid, a psychiatrist here at the Milton S. Hershey medical center is now our guest for Ask Us Anything About Suicide from Penn State Health. We welcome your questions and then to the comment field below this Facebook post. You know one of the interesting stats from the CDC in all that data that was released just over a week ago, was they said that in about 54% of those cases of suicides, there’s an underlying diagnosed mental health condition. That actually sounds low, but I think the keyword there, is diagnosed. Dr. Ahmad Hameed – You’re absolutely right, Scott. As I’ve said earlier in our conversation, about 90, maybe 95, let’s go with 90% of the people who actually commit suicide have either a diagnosed or diagnosable, just because somebody did not see a psychiatrist, primary care provider, or was not on any medication, doesn’t mean that they were not suffering from depression, anxiety, listing off the mood symptoms of psychosis. Or they had issues with substances, alcohol, opioids, or et cetera. Scott Gilbert – Now another interesting thing about the CDC stats is the variance in geography. For example, extremely low suicide rates in a place like Washington DC, high rates in Montana. And somewhere in the middle, states like Pennsylvania. Do we know anything about the geographical disparity? Dr. Ahmad Hameed – Absolutely. Again, simple, it sounds like a complicated question, but again, [inaudible] is very simple. So what do we have in Montana? We have a small population, we have people who are spread far apart. We have lack of mental health services. We have lack of mental health resources. Families, when it comes to families, social support, people are not as closely connected. So again, it’s there. Scott Gilbert – A good question from Lisa. How do you know when the time is right to call for help for someone? So this sounds like a question of if that person is really in a shell, and they’re not coming out, and you’re afraid they’re going to do something, what is that next option? Dr. Ahmad Hameed – Okay, I will answer this. I’ll have two different answers. If the question is when is the right thing for the loved one to call, there is no wrong time. If you’re concerned, you need to make the call. Again, I ask the loved ones would you rather wait and wait for a bad outcome? Or would you rather be safe? And I’ll go with safe over being sorry. So I think that that’s very, very important. As far as the patient, it suffers concern. If they feel that they’re not doing well, if the, if there is increasing intensity of having suicidal thoughts, having wishes of not living, it’s creeping in, which is not normal for them, that’s the time to come and talk to somebody and say you know what? This is happening, I’m having more and more of these thoughts. These are uncontrollable thoughts, I need help with my mood, anxiety, my meds are not working, my therapy’s not working. Those are the times. If it’s one of those things where somebody has gotten into those five to 10% of the folks who can possibly kill themselves, a loved one needs to be very aware. If there is for example, just an example, acute financial loss. Loved ones should be aware to provide the support. If there are legal troubles, somebody comes and is a nice person, [inaudible] society, gets into trouble, loved one needs to be aware to provide appropriate resources at that time. So it all depends on whether it’s the loved one or the patient. Scott Gilbert – Okay, great advice. Thank you Dr. Hamid. As we wrap things up here, any closing advice, including any resources that come to mind? Like I said, we’ll add links in the comment field here, but any resources in particular that you want folks to know about? Dr. Ahmad Hameed – Absolutely. If you think that you or your loved ones are in danger to act impulsively and do something that would lead to you ending your life or your loved one ending your life, you should not wait. You need to call locally crisis, bring the loved one or yourself to the local emergency room very quickly. If you can’t do that, then if you think somebody’s not going to be willing and happy, call the local law enforcement. Other than that, suicide prevention hotlines are there. There are a couple of phone based hotlines. We’ll provide you with the link, CDC has a lot of resources. American Foundation for Suicide Prevention has a lot of resources. Samsa has a lot of resources. Department of Health has a lot of resources that people can use, provide lots and lots of information about the resources that are available. At Penn State Health, we have a robust department of psychiatry, you can contact us, our number is available. Ask us, we will help you. We have wonderful outpatient programs here. At Penn State at northeast drive. And our colleagues at Pennsylvania Psychiatric Institution have a wonderful outpatient program. They have the outpatient programs and partial, in terms of outpatient programs. So that local resource is available. And again, we will help. Scott Gilbert – Fantastic. Many groups and individuals in organizations are there to help you or your loved one if you need help with this type of thing. So please take advantage of those resources. And Dr. Ahmad Hamid, a psychiatrist here at the Milton S Hershey Medical Center, thank you for your time today. Dr. Ahmad Hameed – Thank you very much Scott for giving us the opportunity to talk about this important thing. I just want folks to know if you’re suffering, you’re not alone. We are there to help you. Let us know, there are lots and lots of resources and we will do our best that it doesn’t happen to you or your loved one. Scott Gilbert – Dr. Hamid, thank you very much and we thank you for watching Ask Us Anything About Suicide from Penn State Health.